The Milwaukee Brewers have acquired right-handed pitcher Yhonathan Barrios from the Pittsburgh Pirates in exchange for third baseman Aramis Ramirez and cash. The announcement was made by President of Baseball Operations and General Manager Doug Melvin. Barrios, 23, has split the season between Double-A Altoona (20g, 0-1, 1.48 ERA, 10 saves) and Triple-A Indianapolis (13g, 1-2, 4.60 ERA, 1 save). He went a combined 1-3 with a 2.68 ERA and 11 saves in his 33 relief appearances (40.1 IP, 36 H, 15 R (12 ER), 17 BB, 21 K, 1 HR). Barrios will be assigned to Double-A Biloxi. Barrios, who began his professional career as an infielder, was originally signed by Pittsburgh as a non-drafted free agent on July 5, 2008. He converted to pitcher in 2013. He led all Pirates farmhands in saves (15) last season while pitching at Class-A West Virginia (26 games, 4 saves) and Class-A Bradenton (15 games, 11 saves). Ramirez, 37, batted .284 with 65 HR and 262 RBI in 455 games as a Brewer (2012-15). He was signed by Milwaukee as a free agent on December 14, 2011. He is batting .247 with 11 HR and 42 RBI in 81 games this season. Ramirez, who has announced his intention to retire following the 2015 season, ranks fifth on the all-time Major League list for home runs as a third baseman (375). He returns to Pittsburgh where he began his Major League career (1998-2003). Overall, Ramirez is a career .284 hitter with 380 HR and 1,384 RBI in 2,138 games between Pittsburgh, Chicago-NL (2003-11) and Milwaukee. The Milwaukee Brewers today had four players selected to the Major League Baseball All-Star Game. It marks only the fifth time in franchise history that the team has had four All-Stars. Center fielder Carlos Gomez (starter), third baseman Aramis Ramirez (starter), catcher Jonathan Lucroy and pitcher Francisco Rodriguez will represent the Brewers at this year’s Midsummer Classic, which will be played at Target Field in Minnesota on Tuesday, July 15 at 7pm CT. In addition to the 2014 season, the Brewers had four All-Star selections in 1980 (Cecil Cooper, Paul Molitor, Ben Oglivie and Robin Yount), 1982 (Cooper, Rollie Fingers, Oglivie and Yount), 1983 (Cooper, Oglivie, Ted Simmons and Yount) and 2007 (Francisco Cordero, Prince Fielder, J.J. Hardy and Ben Sheets). 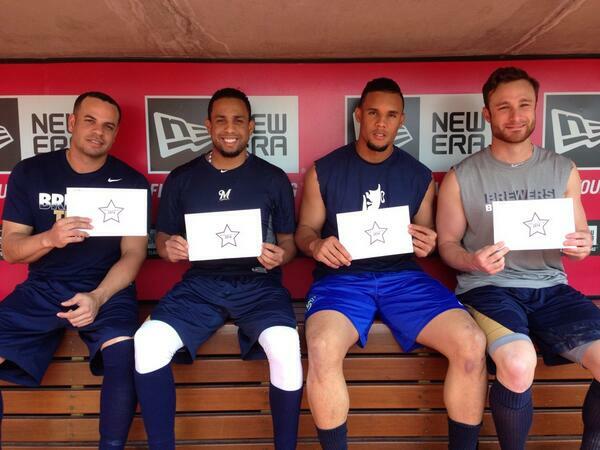 The Brewers have multiple All-Star starters for the seventh time (1980, 1982, 1983, 2007, 2010, 2011 and 2014). Gomez, 28, has been selected to his second All-Star Game and first as a starter. He was a first-time All-Star last season. Gomez finished second among National League outfielders in fan voting (4,068,745), trailing only the Pirates’ Andrew McCutchen (4,519,440) and just ahead of the Dodgers’ Yasiel Puig (4,059,746). He is batting .299 with 13 HR and 45 RBI in 80 games this season. Ramirez, 36, has been selected to his third All-Star Game and second as a starter. He started the 2005 All-Star Game as an injury replacement for Scott Rolen. He was also an All-Star in 2008. Ramirez had 2,318,611 votes in fan balloting, finishing ahead of the Mets’ David Wright (1,979,883). He is batting .287 with 11 HR and 41 RBI in 63 games this season. Lucroy, 28, has been selected to his first All-Star Game. He was selected via the player vote, finishing first among National League catchers with 420 votes. Lucroy is batting .329 with 9 HR and 44 RBI in 82 games this season. He entered today’s game leading the National League in multi-hit games (31) and among the league leaders in batting average (2nd), doubles (2nd), hits (T3rd), on-base percentage (4th), slugging percentage (5th), OPS (5th) and extra-base hits (5th). 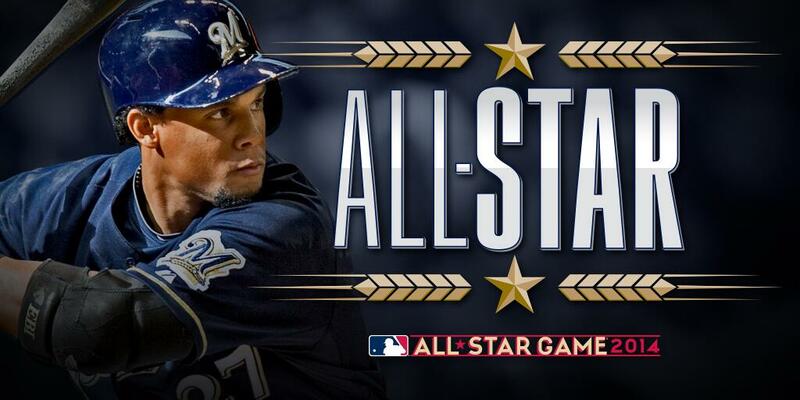 Rodriguez, 32, has been selected to his fifth All-Star Game. He was also an All-Star in 2004, 2007 and 2008 with the Angels and in 2009 with the Mets. Rodriguez was selected via the player vote, finishing second among National League relievers with 138 votes, trailing only the Braves’ Craig Kimbrel (190). He is 3-2 with a 2.34 ERA and 27 saves in 42 appearances this season while holding opponents to a .187 batting average. His 27 saves tied Kimbrel for the Major League lead entering today’s game. You’re not seeing things. Aramis Ramirez has taken over the top spot in the latest National League All-Star balloting update provided by Major League Baseball. Carlos Gomez has also moved back into starting position and Jonathan Lucroy has passed Buster Posey for second place among NL backstops! Oh, and how about Jean Segura in second among shortstops and Mark Reynolds and Rickie Weeks both getting on the board at their respective positions in 4th place? In the third update of National League voting totals for the 2014 MLB All-Star Game, Carlos Gomez has jumped two positions to move into third place among NL outfielders in the league’s tightest race with 1,192,174 votes. He is less than 67,000 votes behind Giancarlo Stanton (1,259,047) for second place. 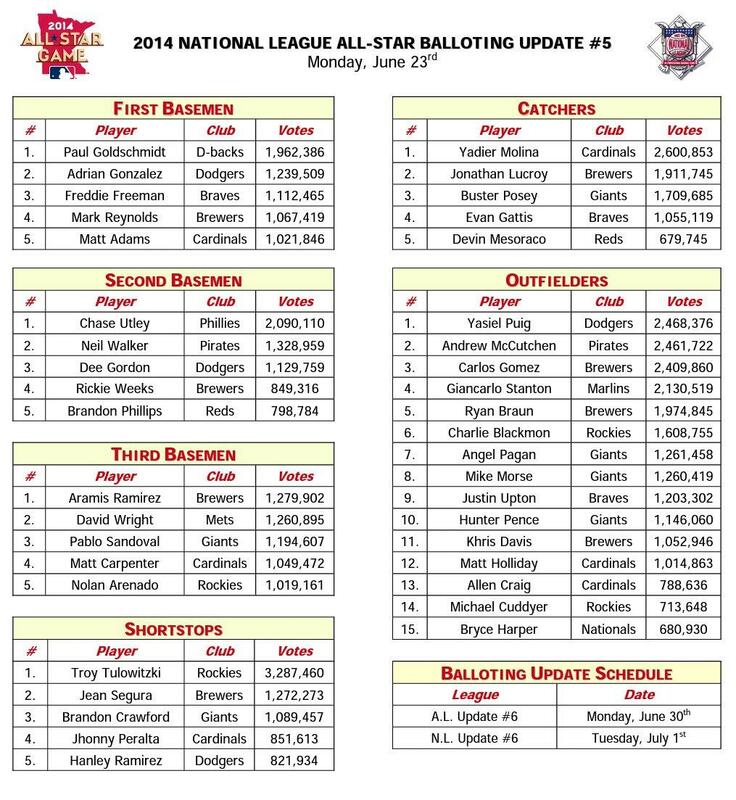 Yasiel Puig currently leads all NL outfielders with 1,472,717 votes. Gomez ranks among the National League leaders in a number of offensive categories, including slugging percentage (4th, .554), total bases (4th, 128), extra-base hits (T-4th, 31), runs (T-5th, 42), doubles (T-5th, 17), batting average (7th, .307), home runs (T-8th, 12) and stolen bases (T-10th, 11). He is one of three players in the majors with at least 10 home runs and 10 stolen bases this season, joining Colorado’s Charlie Blackmon and Minnesota’s Brian Dozier. Ryan Braun, one of 10 National League players with more than one million votes, is sixth among outfielders with 1,058,680 votes in the tightly-contested outfield race. Jonathan Lucroy remains third among National League catchers with 771,313 votes, trailing the Cardinals’ Yadier Molina and the Giants’ Buster Posey. Lucroy is among NL leaders in multi-hit games (T-1st, 24), doubles (T-2nd, 23), batting average (3rd, .335), hits (4th, 75), on-base percentage (6th, .398) and slugging percentage (10th, .500). Jean Segura (567,481 votes) ranks third at shortstop, Aramis Ramirez is now fourth among NL third basemen (615,597 votes) and Khris Davis (459,771 votes) moved up a spot to 13th in the outfield. Balloting at Miller Park continues through this Sunday, June 15, comprising 23 home dates. Fans can vote for the Major League All-Stars online at Brewers.com through Thursday, July 3 at 10:59pm CT. Brewers fans have the well-earned reputation for filling the ballot boxes with All-Star votes for Milwaukee Brewers players year in and year out. With at least one Brewers player elected to start in five of the last seven All-Star Games since 2007, Milwaukee fans demonstrated that it doesn’t take the largest market to be heard as they voted for their favorite Brewers in almost unheard of numbers. This season, eight Brewers players are featured on the ballot for the 85th Major League Baseball All-Star Game to be held on Tuesday, July 15 at Target Field in Minneapolis. 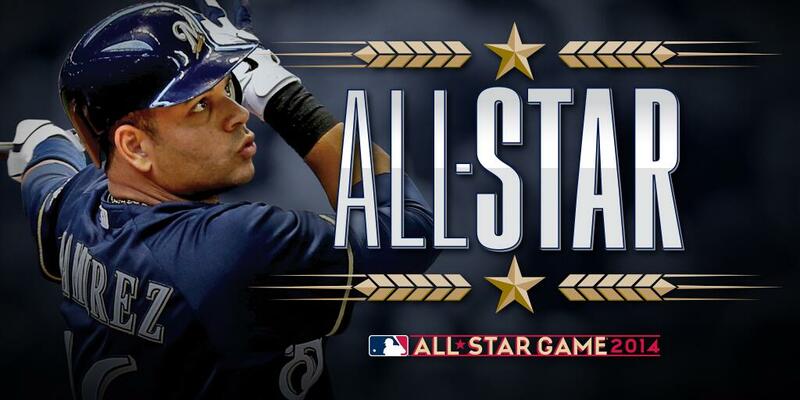 Brewers fans will again have the opportunity to show their overwhelming fan support by helping decide which players will be named to the Midsummer Classic through the 2014 MLB In-Stadium All-Star Balloting Program and the 2014 All-Star Game MLB.com Ballot. 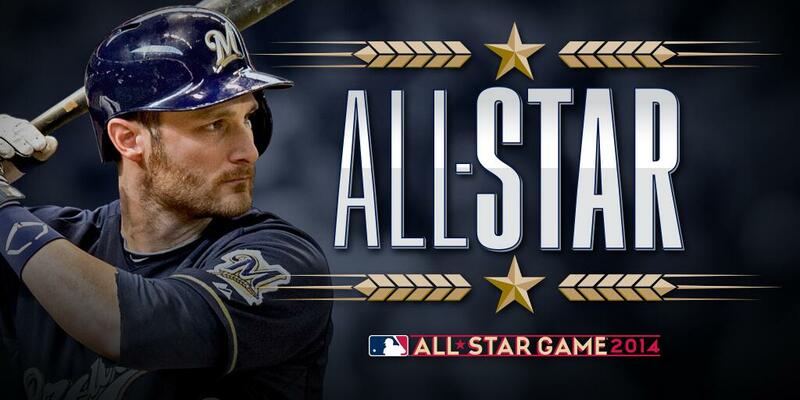 Brewers players on this year’s All-Star ballot include C Jonathan Lucroy, 1B Mark Reynolds, 2B Rickie Weeks, 3B Aramis Ramirez, SS Jean Segura, OF Ryan Braun, OF Carlos Gomez and OF Khris Davis. At Brewers.com, all fans voting 21 or more times for their favorite Brewers will be entered into a drawing to win a prize package that includes: four Field Box tickets to a mutually agreed-upon game, an opportunity to go down Bernie’s slide (restrictions apply), an opportunity to watch batting practice that day from the field and a meet and greet with five-time All-Star Ryan Braun. There is a maximum of 25 votes per email address. More information and rules may be found at Brewers.com. Additionally, fans voting online will be eligible to purchase Field Outfield and Club Outfield seats for select Brewers games at a savings of up to 50% (details available after voting at Brewers.com). Those visiting Miller Park are encouraged to vote early and often via paper ballot at the All-Star Polling District, set up during Brewers home games along the first base concourse. In-park balloting at Miller Park continues through Sunday, June 15, comprising 23 home dates. The Vote Brewers! campaign features event staff decked out at home games in promotional t-shirts, and signage along the Miller Park fascia and behind the plate. In addition, media partners FOX Sports Wisconsin and Newsradio 620 WTMJ will be promoting the initiative on broadcasts, and the World Famous Klement’s Racing Sausages will help distribute voting information around the city. There will also be voting parties staged during the balloting period. With every 10 ballots turned in to the All-Star Polling District, fans will receive one raffle ticket that will enter them in a drawing for the opportunity to win a collector’s item daily, ranging from game-used memorabilia to player autographs. A drawing will be held during every home game through June 15 and the winning ticket will be announced during the game. Rules will be available at the Polling District. Last season, Gomez and Segura represented the Brewers at the Midsummer Classic. Ryan Braun narrowly missed being elected a starter for the 2012 MLB All-Star Game after finishing fourth in voting among National League outfielders to Matt Kemp of the Los Angeles Dodgers by just over 100,000 votes. Braun was later named a starter to replace the injured Kemp. In 2011, Braun led National League outfielders in voting for the fourth straight season and led all NL players in voting for the first time (5,928,004). He is the only Brewers player to ever be elected to start in four consecutive All-Star Games (did not play in 2011 due to injury). Rickie Weeks was selected to his first All-Star Game as the NL’s starting second baseman and Prince Fielder started and made his third All-Star appearance in 2011. In 2010, Braun and Corey Hart started for the Brewers (Hart was named as a starter after an injury to Atlanta’s Jason Heyward). In 2009, Braun and Fielder joined Trevor Hoffman as All-Stars. In addition to Braun in 2008, Hart was named that year to the National League All-Star team via the Monster All-Star Final Vote. In 2007, Fielder received the second-most votes in the National League en route to his first career All-Star team, becoming the first Brewers player to be voted to the All-Star Game since Paul Molitor was selected at third base in 1988. A complete list of All-Stars in franchise history can be found on page 285 of the 2014 Brewers media guide. Both the National League and American League teams will have eight fan-elected starters. The pitchers and reserves for both will be determined through a combination of “Player Ballot” choices and selections made by the two All-Star managers.